The Kiwi Collection is our entry level modular Melteca system in 18mm white Melteca. With its sleek and modern look this is a great wardrobe system for people on a budget that don't want to compromise on look and quality. The drawers have trimmed down fronts so no handles are required/supplied. You could add them yourself, or we can for an additional cost if you prefer to have handles. Choose from a range of design options below. 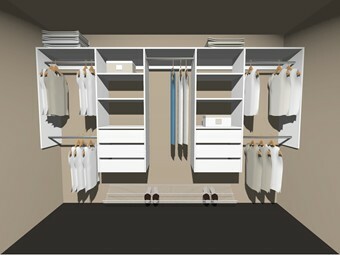 Create your walk-in wardrobe by combining the different designs to suit your needs. 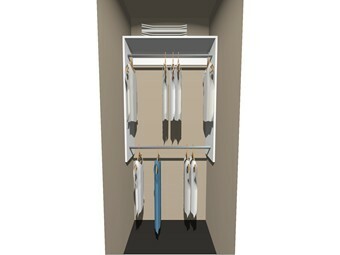 1500mm high x 600mm wide will be centralised (unless otherwise requested) - then we adjust your hanging space either side to complete your wardrobe. The top shelf is installed at 2100mm high to allow for the double hanging. The drawer & shelf unit is at a set size of 1500mm high x 600mm wide will be fitted to one side - then we split the balance of your wardrobe space into double & long hanging. The top shelf is installed at 2100mm high to allow for the double hanging. 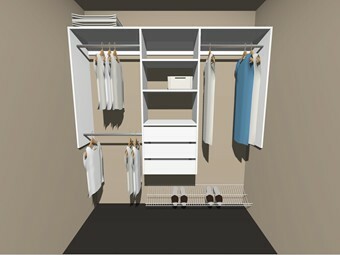 The drawer & shelf unit is at a set size of 1500mm high x 600mm, the balance of the wardrobe is double hanging. The top shelf is installed at 2100mm high to allow for the double hanging. Contact us to discuss your requirements. Double hanging up to 1200mm wide. The top shelf 400mm deep is set at 2100mm high with 1200mm vertical panels. If you wish to have long hanging you can easily remove the lower rail. 1500mm high x 600mm wide drawer & shelf unit. 400mm deep with 3 drawers & 3 open shelf spaces. This would usually be installed so the top is at either 1800mm high or 2100mm high. Drawer & shelf units are a set size of 1500mm high x 600mm wide. The long hanging is centralised (approx. 500mm-600mm) with the balance on either side in double hanging.